At the end of February I published a review of “Learn Windows Powershell 3 in a month of lunches”. Even though it is a well written book from which I learned a couple of things, it did ‘t increase my productiviteit with PowerShell as much as I had wanted. This is probably due to the Windows PowerShell knowledge I already had. 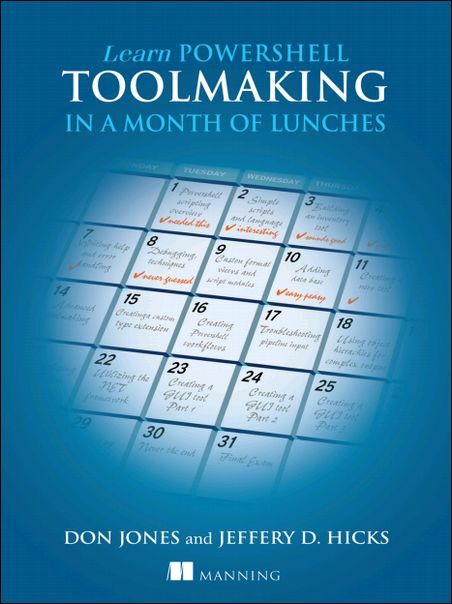 I decided to read “Learn Windows PowerShell Toolmaking in a month of lunches” next and I have to say this was exactly what I needed … and more. I think it really made my scripts more flexible and easier to maintain and manage. It was also great to see how easy it can be to create a GUI version of your PowerShell script. I will try to post some scripts and GUI examples to my blog soon so you can be the judge :). There were also some things that weren’t (yet) relevant to me, but it is good to be aware of them and being able to revisit them when necessary.